Come see how I made over our camper’s dated bathroom on a budget with a lot of paint and tons of elbow grease! Since renovating Our DIY Camper last year (take the full renovated tour from last summer right here), we’ve had so much fun camping in it. I think it’s one of the best purchases we’ve ever made and renovations we’ve ever done! 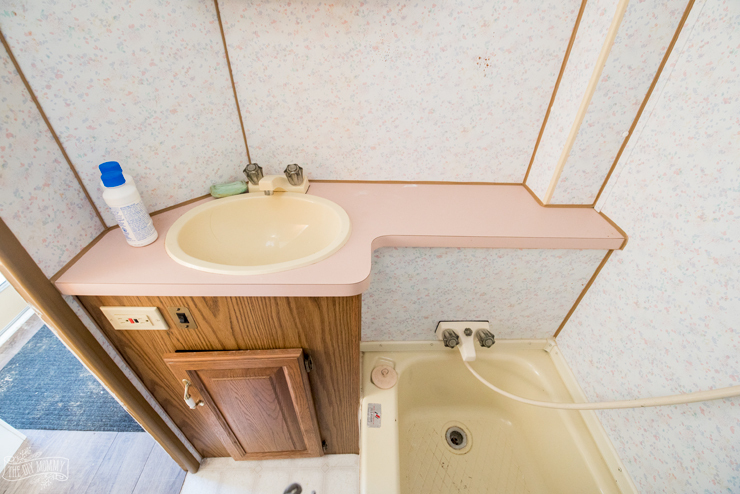 I did leave one area undone to tackle this year, and that was the RV’s tiny bathroom. I knew it would be a ton of work even though it’s so small, and I was right! 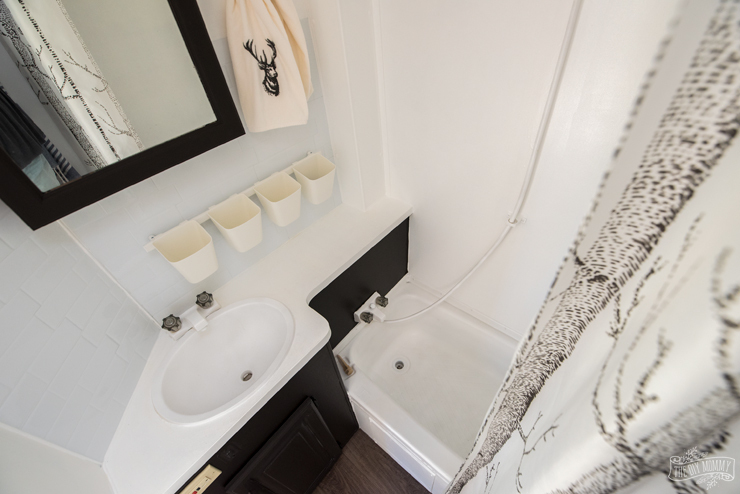 For a small amount of money, I updated the bathroom this summer so that we could enjoy it in all it’s renovated glory for this year’s camping season. 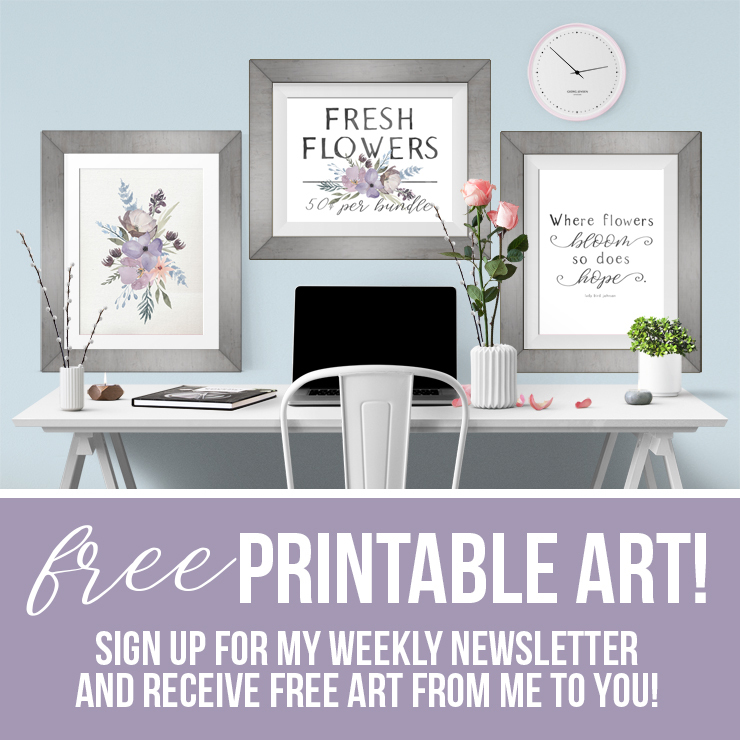 I used lots of items I had on hand – mostly paint! 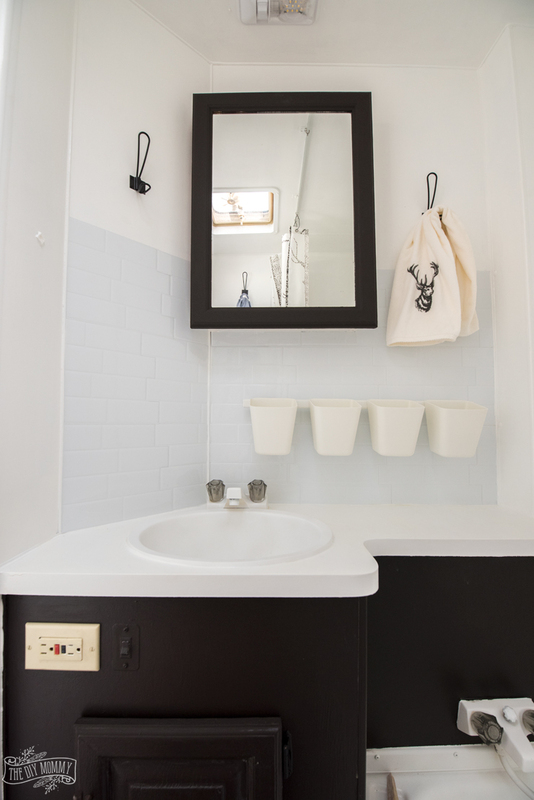 – to give our camper’s bathroom a major makeover on a budget. I cleaned the bathroom thoroughly including all the fixtures with a degreasing cleaner. I sprayed the tub, toilet, sink, and faucets with Rustoleum Tub & Tile Epoxy. I used 3 coats and 5 cans. This product is very toxic, so use a respirator when applying. I’m really happy with the smooth, washable finish and how it’s wearing so far. I spray painted the towel bar and doorknob with Rustoleum Metallics Oil Rubbed Bronze spray paint. I wiped down the door, cupboard and cupboard door with Gloss-Off to roughen up the surface for painting. I painted the door, cupboard, cupboard door, walls, ceiling & counter with Killz oil based primer. This helps the latex paint to stick. I painted the door, cupboard, cupboard door, walls, ceiling & counter with black and white semi-gloss latex paint I had on hand. I used a brush and a foam roller for a smooth finish. I used some leftover SmartTiles I had on hand from the camper’s kitchen makeover and applied them as a back splash a few feet above the countertop. I sealed the cupboard, cupboard door & countertop with Varathane Triple Thick Polyurethane. I love how this repels water and keeps the paint from scratching or flaking off. You could also use this to seal your shower walls – we don’t really use our camper’s shower, so I didn’t seal the walls. I hung new black hooks on the walls and a rail with cups I found at Ikea over the counter to store toothbrushes, hair brushes etc. I used a vinyl plank flooring called Allure Stayplace Quincy Oak, cut it with a ruler and utility knife, and stuck it in place to cover the old vinyl flooring. 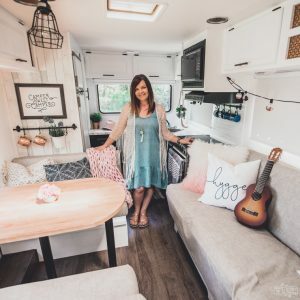 I’m absolutely thrilled with how our camper’s bathroom makeover turned out, and I can’t wait to keep taking our RV out to enjoy the summer together! This makeover truly goes to show how you don’t have to spend a ton of money to completely makeover a space. Paint makes a huge difference! 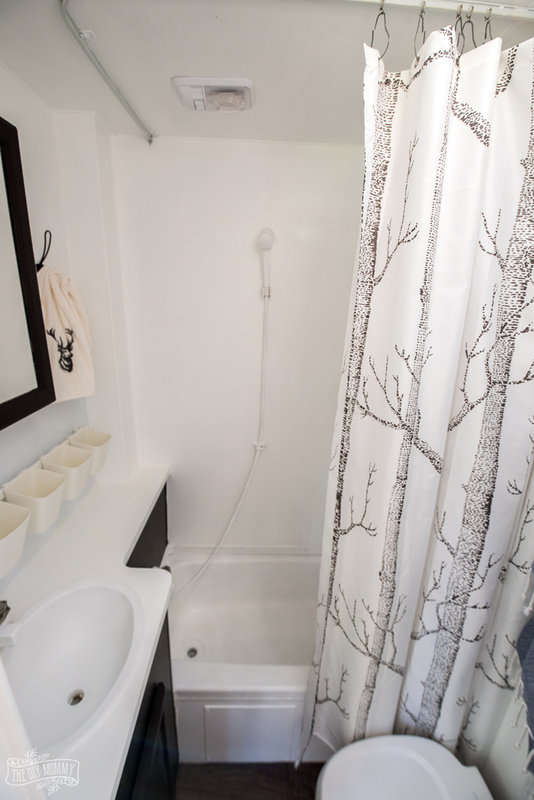 Now tell me: What do you think of Our DIY Camper’s bathroom makeover? What a transformation! 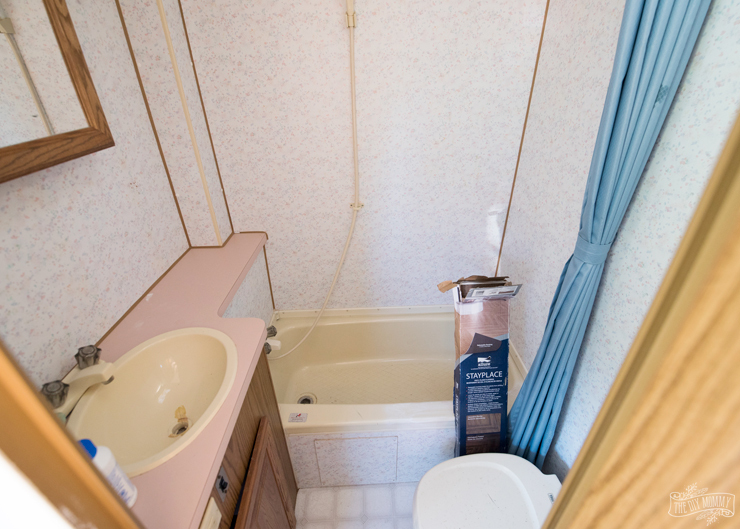 We just bought a trailer and, although it’s new, the style of it (mostly the oatmeal walls and strange upholstery) is a bit dated. 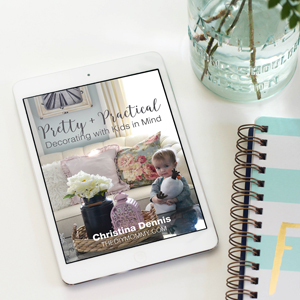 Your trailer makeover has really inspired me to tackle some updates on my own! This is awesome. A true testament to the power of paint and hard work… and a few accessories. 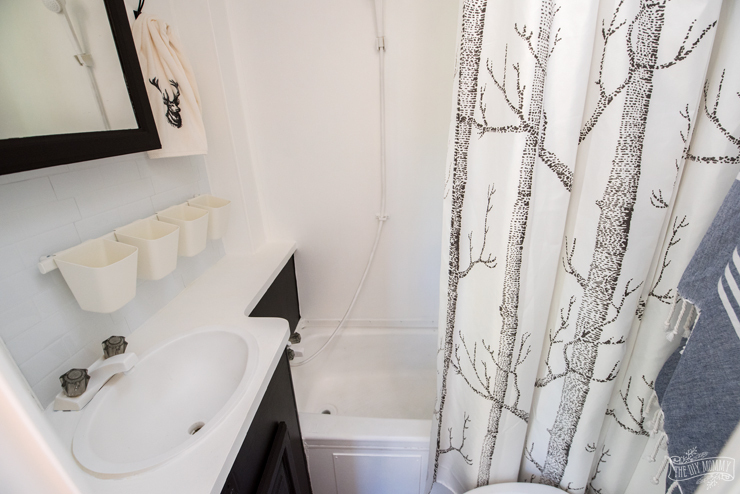 (I have that shower curtain too and looooove the pattern.) So happy to hear that you’re enjoying your RV so much. 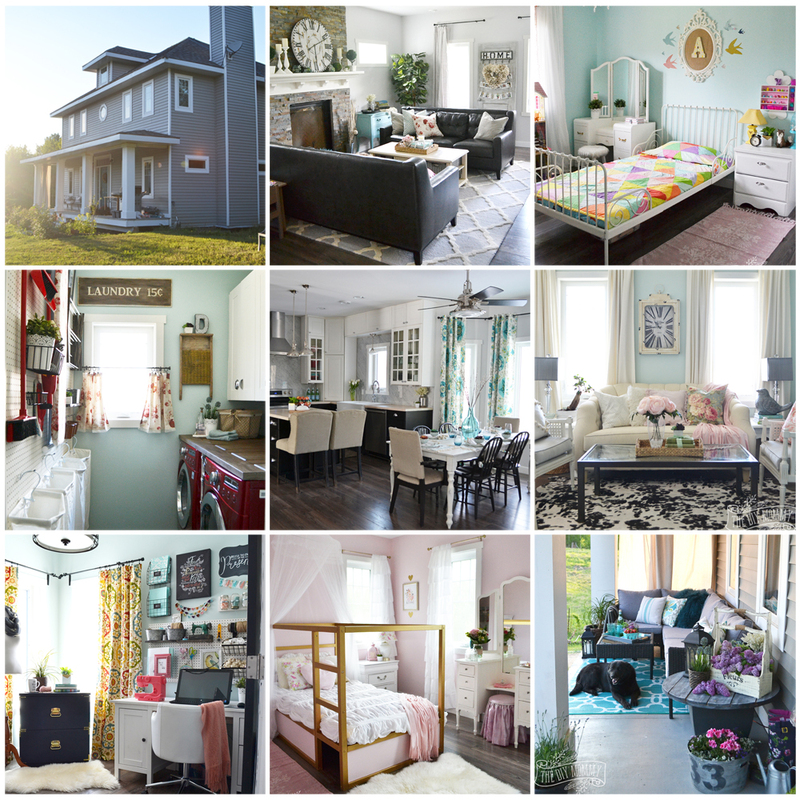 What an incredible makeover! Looks so much better, I love it. Where did you get the deer towel? 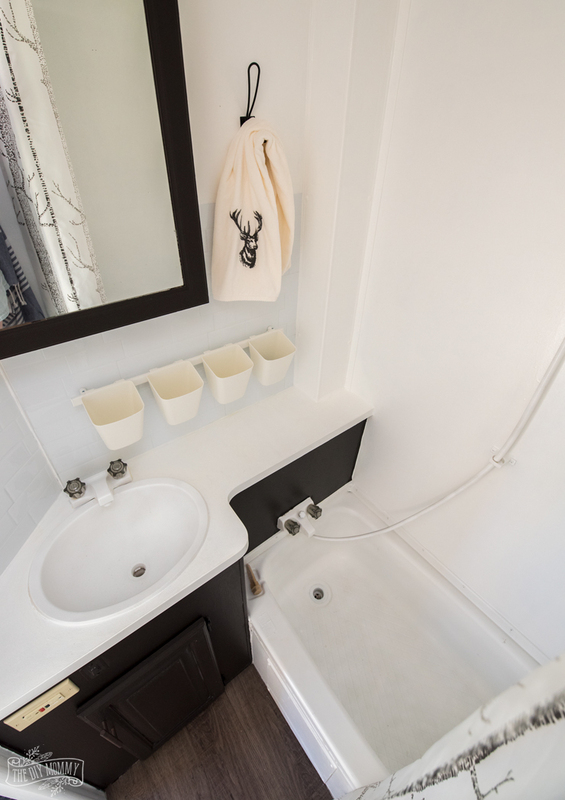 Is the bathtub the original tub and surround? I’m not sure what to do about ours! Hi, it takes so long so there’s so much progress already! Its really helpful to me. Cause I am going to remodel my bathroom next month. Thanks for the sharing this at the right time. Keep up with good work. 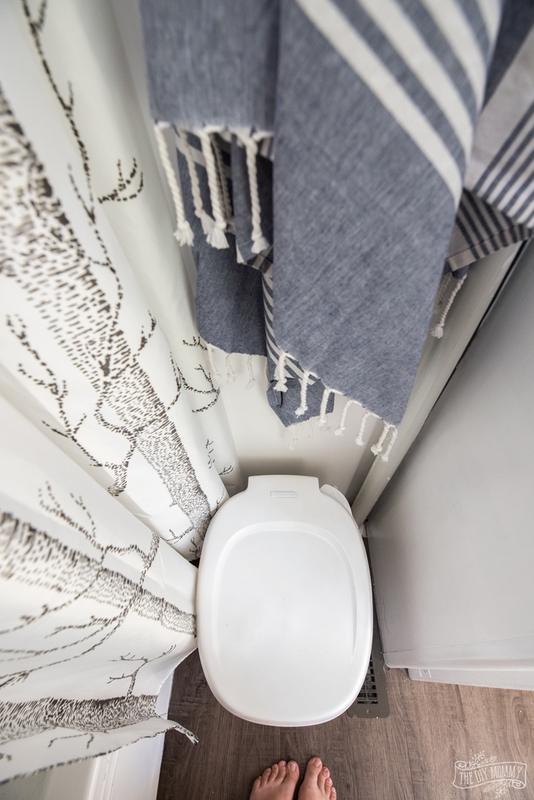 You have totally transformed your bathroom. It looks beautiful. When you are dealing with home renovations, the choices are eventually all yours. You are the person who needs to cherish the outcomes you end up with. The sky’s the breaking point when it comes to renovations. 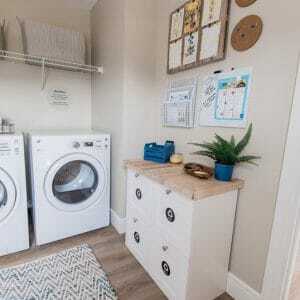 You can accomplish something standards like updating your kitchen or bathroom, or you can accomplish something progressively unique like adding a stage for storage to a room.